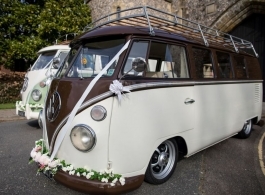 1964 VW Campervan in Chocolate Brown & White with a beautiful and spacious Cream and Green interior. Chauffeur driven and guaranteed to turn heads with its unique colour scheme, this classic VW Campervan will come dressed with a beautiful garland and your choice of colour ribbons & bows. The VW can also be styled to the theme of your wedding upon request.